Guests had to enter via this rustic wooden staircase and they were met by a custom designed signage with potted plants. The long table was lined with floral lanterns on top. The tables were small so we made mini floral arrangements with gold toppers. Each place setting had a custom made menu card and cookie favor. 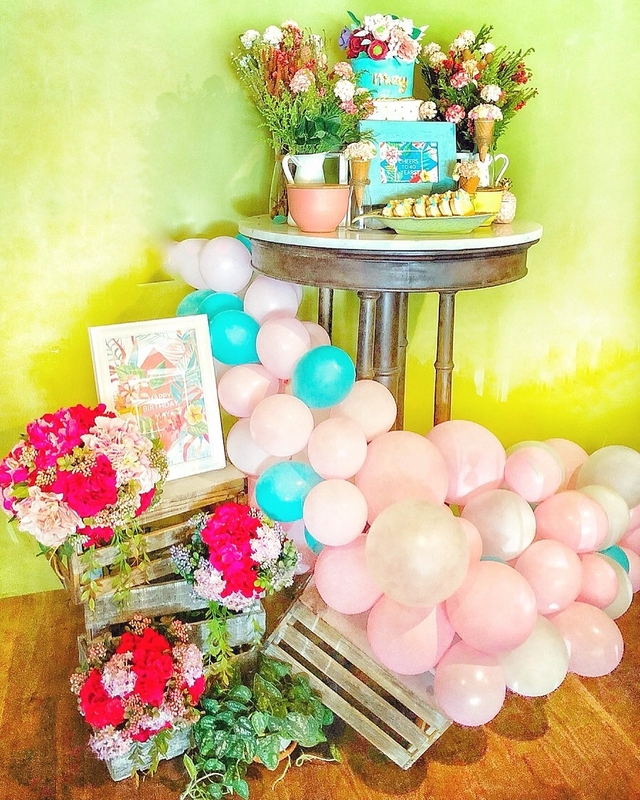 We had a mini birthday cake table which we flanked with a stack of styled crates with florals and a balloon garland. The tropical cake had beautiful fondant flowers and it was surrounded with lush floral arrangements, floral icing cones and custom made cookies. The other side of the room had a huge rectangular table where we put the main centerpiece with acrylic painted frames, cookies, crates and plants, all of which matched the interiors perfectly.